During 2018, it is estimated that around 140 million babies were born and that around 60 million people died. The global population had reached 7.7 billion at the end of 2018. In addition, around 41 million legal abortions were carried out in 2018. There may also be a significant number of illegal or unreported abortions so that the total number may be around 50 million. Global fertility rates are declining inexorably. 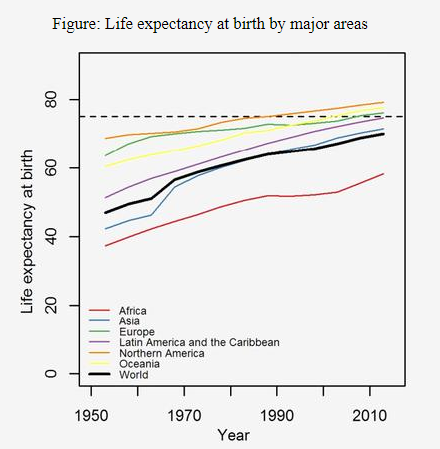 The number of babies born will be reducing over the next 100 years (with the biggest declines expected in Africa). The crude death rate is a balance between two trends; first the decline due to improving health care (and longevity) and second the increase due to an increasing population of the aged. By around 2090 deaths will exceed births and by 2100 the world population will be in decline. Abortions are not recorded in either birth or death statistics. But what is not in doubt is that the actual number of babies born is almost 30% lower because of abortions. If abortions were included in both birth and death statistics the natural population increase (births minus deaths) would remain unchanged (190m-110m instead of 140m-60m). However, abortions would then be the single highest cause of death. The next highest cause of death would then be coronary artery disease (around 10m). The long term, global, fertility and morbidity trends are not affected by the number of abortions. Even if no abortions took place, world population would still stabilise and then decline but this would be delayed by about 40 years (stabilisation and decline in 2130 instead of about 2090). That abortion is now a significant demographic parameter is self-evident. The morality or rightness of carrying out abortions is a different matter and primarily for women to decide on. The human species is the only one which has the ability to, and does, carry out intentional abortions. That women should be assisted to carry out abortions to preserve their health or for other necessary medical reasons (physical or mental) seems obvious. I am not so sure that assisting abortions for the convenience of the mother or for covering up carelessness is equally justified. Or that 41 million legal abortions is a number to celebrate or to be particularly proud of. This entry was posted on January 15, 2019 at 9:30 am and is filed under Demographics. You can follow any responses to this entry through the RSS 2.0 feed. Both comments and pings are currently closed.